The Tribal Development Forum (TDF) was the first People’s Organization to be formed in 1992 by Astha Sansthan. Between 1986 and 1990, organization and training, awareness raising, struggle, action, reflection-on-action, took place. In 1990, the various village and gram panchayat (village council areas) groups came together to struggle for higher payment for the collection and sale of tendu leaves. From the struggle, they went on to form a Tendu Leaf Collectors’ Cooperative. This struggle and constructive action was empowering, and led the Astha team & the group leaders, to the decision to form a Block-wide People’sOrganization to work together and share the analysis about the variety of issues confronting the people. 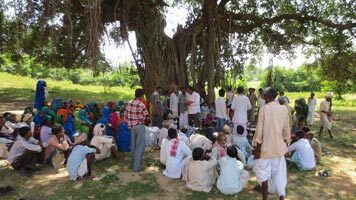 Over the years, the men and women of the Tribal Development Forum have continued to work together on both struggle and constructive action, and have expanded their Forum to the neighbouring Block of Jhadol in Udaipur District, and to now four Blocks in neighbouring Sirohi District. There are 8705 persons took membership of the Forum. They have worked on soil and water conservation projects, Tribal Self Rule at the village level, networked widely in the state, and even in the country, on issues of livelihood affecting their lives. The Tribal Women’s Awareness Society has been working in Jhadol and Girwa Blocks of Udaipur District, and they have been working on the issues of gender equality, violence against women, women’s empowerment. The Awareness Society started a “Women’s Court” to bring quick and just decisions in matters brought to it, by tribal women in the area. The Women’s Court operates as part of the work of the Social Reform Committee, and also, the members meet to plan for needed changes in social customs like reducing expenditure of marriages, and reducing the amounts of “bride price” (dappa). The various issues that the Tribal Women Awareness Society has been working on recently, include: claiming homestead land rights for homesteads on Forest Department land, the implementation of the Employment Guarantee Scheme, Tribal Self Rule, resolving cases of domestic violence and violence against women through women’s court. The Society has successfully implemented the UNDP supported project “Social Mobilization Through Natural Resource Management for Poverty Alleviation and Women’s Empowerment”. Anicuts were made, pastureland developed, wells were recharged, and contour terracing on the private lands of the tribal families were constructed. At present, the Society is working in 121 villages of 41 Village Council areas (Gram Panchayats) in Jhadol, Sarada and Girwa Blocks of Udaipur District. The membership of the Society is 7,442 women. The Gordward area of Bali block in the Pali district is feudal tribal area of Marwarl cultural area of Rajasthan. It is history of the area that dominant higher class has exploited poor, marginalized and tribals of the area. In 1998, Gorward Tribal Association has been formed with the objective that people will get organise and raise voice against exploitation and fight for rights. With this thought the association realised need to work in 129 villages of Bali and Desuri blocks of Pali district on issues – forestland, labour, water, health, education, raise voice against inequality, right to information, food security, MNREGA. In the beginning, political parties tried to repress tribals in Bali area, now the Association has identity in the local Administration and political parties. Till now there are 2760 members in the association and its members reside in Bali and Desuri Blocks of Pali District. The tribals of the area are mostly Garasias, a member of the Bhil tribal group. The Association was established in 1997 in Dungarpur District, and at present it is working in four Blocks of Dungarpur and two Blocks of Banswara Districts. The Vagad area is a Bhil tribal area, and comes under the Schedule V Areas. The Vagad Farmers Labourers Association is working on issues like; Forest Rights Act, minimum wages under MNREGA, tribal self-rule under PESA Act and implementation of pro-poor Acts and policies in Dungarpur and Banswara districts. Objective behind formation of People’s Organisation is to organise people around the issues that affecting in large number and fight to get justice on time. The Association is holding meetings with the community, organising campaigns, having dialogue with the administration, handing over petitions of demands, capacity building of local leaders (both men and women). The Association is having membership of 22,255 people. 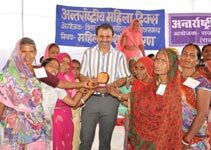 The Association of Strong Women Alone (Ekal Nari Shakti Sangthan) was formed in the year 1999 as a follow up of the state level convention for widows from different parts of Rajasthan. The issue was first taken up by Astha in 1997 and efforts were made to bring widows into the mainstream of society through interventions with government and non-government agencies working with women. In a joint effort to find a better model for intervention a convention of 425 widows was organized in 1999. In a follow up meeting after the convention, widow representatives from different districts decided that there are other single women such as divorced, separated, older never married women, married women whose husbands are mentally unwell etc. whose struggles and pains are almost same as those of widows, and who too should included in the Association. Since the beginning till now, the Sangathan is ever growing and becoming stronger. At, present, the Sangathan is working in 33 districts, 115 blocks and has a membership base of 67,238 members. 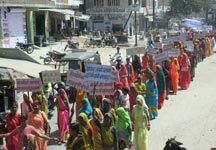 With the inspiration from the Rajasthan Association of Strong Women Alone, similar organizations have been formed in other states of the country. Visit www.strongwomenalone.org for more details about the Association of Strong Women Alone. 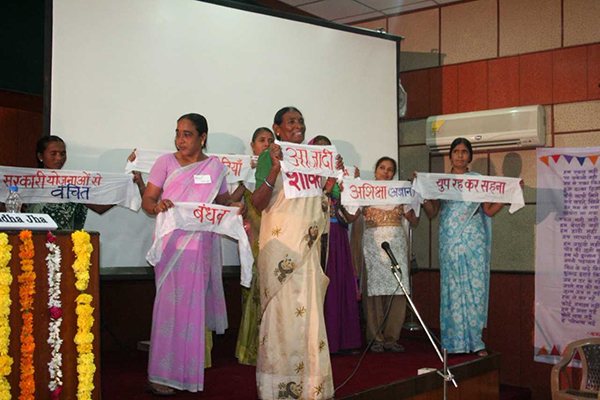 In July 2008, state-level Associations of Single Women and “back-support” NGOs supporting them, from 7 states, met in Ahmadabad and decided to raise the issues of Single Women nationally. This meeting laid the foundation for the National Forum of Single Women’s Rights, which was finally launched in the year 2009 – as a low-income Single Women led platform. “We, the Single Women, are taking the lead in the National Forum and we are committed to create a New Society with the values of – Equality, Compassion, Justice, Non-Violence and Honesty! In 2019, Single Women in 11 states and 1 Union Territory are organized and are together members of the National Forum. In all more than 145,000 Single Women are associated with the National Forum. Objectives for which the National Forum works are – to change the perception of Single Women as “weak and helpless” to “Strong and Able”; to make Visible nationally, the issues of Single Women; promote and develop leadership of Single Women at the National Level; to help organize Single Women in states where they are not organized. 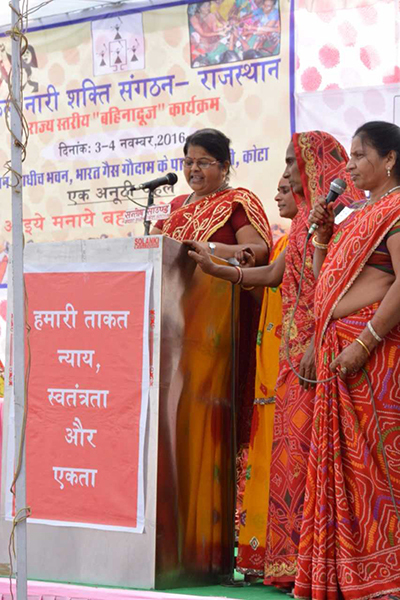 ‘Rajsamand Women’s Forum’ (Rajsamand Mahila Manch) was formed with public opinion to promote women participation in development that helped in stentorian the voice of women in the area. Working area of the Forum is in 206 villages of 75 village councils in six blocks of Rajsamand district. There are 7157 members associated with the Forum. The forum’s major objective is to organize poor and marginalized women, so that they understand their collective strength and can make efforts towards changing their socio-economic conditions and link them with mainstream of the society. RMM is focussing its work on domestic violence, violence against women, child, marriage etc. Visit www.rmm.org.in for more details about the Rajsamand Women’s Forum.